Click below to check our simple training tips. Do: Wear them in first. Do: Speak to a specialist retailer or sports physio to ensure you wear the correct shoe for the type of running you are doing. Do: Seek the advice of a sports physio to help you separate the pain associated with fitness progression, from the early warning sign of injury. 5. Don’t: Ignore the importance of hydration. Do: Drink fluid little and often throughout the day. Do: Warm up with a few mobilising exercises or a gentle jog before your run; cool down in the same way, followed by stretching. See your sports physio to organise a stretching programme. Do: Increase your mileage by no more than 10 per cent per week. Do: Vary your training working out a balanced programme with hard days and easy days, and rest completely at least one day a week. We recommend for all runners of all levels that you have your running style assessed. We have a great link with a superb running specific coach. Please ask us for further details. Our friends at Sweatshop in Meadowhall also offer video analysis as a free service to check the movement of your foot and heel when running. This will help determine the type of running shoe you should wear. There are many sports shops who offer this service so please check them out before you buy. Depending on how your foot moves will determine which style of running shoe will best suit you. Sometimes we see clients who waste a lot of money buying off the shelf trainers which don't suit the biomechanics of their foot. There are also many different styles of running, from people who strike with the heel first to people who land more on their mid-foot when running. So be aware of this when buying your trainers. Sweatshop are so confident that you will be fitted out correctly, that they offer a 30 day guarantee to give you 100% peace of mind. As an added bonus, if you do need to purchase new shoes, all clients of the Mark Roe Sports Physio Academy are entitled to a discount - so don't forget to mention this when you go! We warm up to prepare the body physiologically and psychologically to perform a sporting activity. Ideally the warm up should be around 20 minutes, before flexibility or functional activities are undertaken. The warm up should gradually increase in intensity until the heart rate is around 70% of it's maximum. This should allow greater range of movement, increased flexibility, improved aerobic performance and overall improved efficiency. 1. A rise of 2 to 3 degree rise in body temperature which can last for 45 minutes. 2. The rise in heat makes muscles and tendons to become more extensible, which makes stretching muscles and tendons easier. 3. Increased blood flow, which consequently increasesoxygen to muscle tissue. 4. More oxygen leaves the blood and enters muscle tissue. 5. Increased temperature also causes a rise in enzyme and metabolic activity, which improves the efficiency of muscles. 6. Activation of neural pathways, which speeds up reaction time, and improves efficiency of movement during activities. The stretches below are just a few simple ideas to start your daily stretching programme to help you gain flexibility and help prevent against possible injuries. They are by no means exhaustive, and there are other variations and positions which each stretch can be performed in. They are ideal for most sports which mostly involve the lower limbs such as football or athletics. Buttock Stretch - Lay on your back and cross your left foot over right knee. Clasp hands behind right thigh and gently pull the leg up towards your chest. Try and keep your upper body relaxed. Hold the stretch and then gently lower your leg. Try the stretch on your other side. 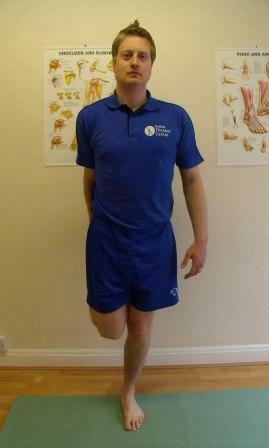 Calf Stretch - In a standing position, face both feet forwards with one leg in front of the other. Keep the back leg straight with the knee locked. Lean your weight forward until you feel the stretch in your back leg. Hold the stretch, then switch sides and try the other leg. Mini Calf Stretch - In the same position as above. However, this time bend both knees aand you should feel the stretch in the lower part of the calf. 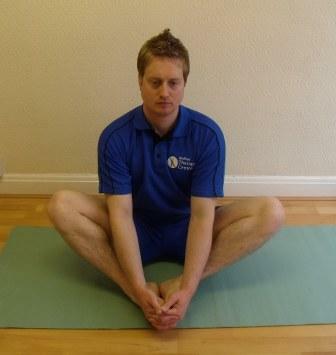 Inner Thigh Stretch - Sit on floor with your feet pressed together. Keep your abdominals tucked in and lean forward until you feel a gentle stretch in your inner thighs. Hold this position. Hamstring Stretch - Lie on floor with both knees bent. Pull the left leg so the knee is pointing to the ceiling. Then start to straighten your left leg and slowly pull it towards you, clasping the thigh, calf or ankle. Keep knee slightly bent. When you feel a stretch, hold this position. 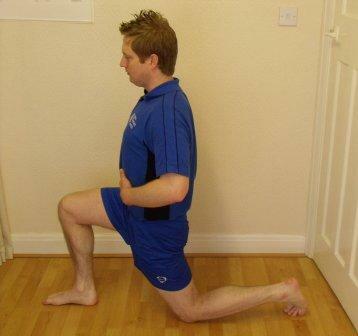 Hip Flexor Stretch - In the lunge position, rest your back knee on the floor, with front knee at 90 degree angle. Tuck your abdominal muscles in and then gently press forward until you feel a stretch in the front of the thigh and hip. Hold the stretch then switch legs. Hip / Lower Back Stretch - Lying on the floor with one leg straight and one leg bent. Pull the bent leg slowly towards your chest until you feel a stretch in your hip. Hold this position, then switch legs. You could try this with both knees up towards the chest at the same time. This also helps to stretch your lower back. Thigh Stretch - In standing, take hold of your right leg, and pull the heel towards your buttock. Try to keep the bent knee pointing down towards the floor. When you feel the stretch in the thigh, hold this position. Switch legs after the stretch. 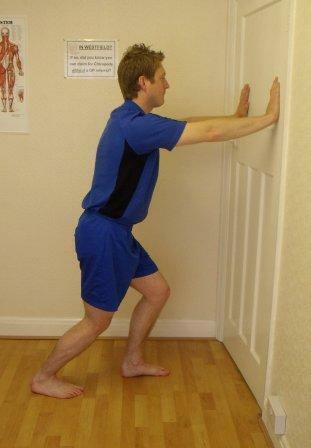 If your balance is poor it's a good idea to put one arm out to hold against a wall. Or if you stare at a point a couple of yards in front of you, your balance will usually improve. It's a good idea after every session to take a few minutes to perform a warm down. A good warm down will help prevent the dreaded Delayed Onset Muscle Soreness (D.O.M.S.) which we feel for upto 48 hours after exercise! 1. Take time after every training session to stretch your muscles for around 4-5 minutes. 3. Continue to drink water throughout the warm down period. 4. Keep the muscles warm and clothed throughout the warm down. 5. Warm down until your heart rate is around 120 bpm. 6. Try to combine a cool down with protein shake / carbohydrates to replenish glycogen stores, and to supply the muscles with quality amino acids to speed up the rebuilding of the muscle. Click here to read Mark's article from the Sheffield and Hallamshire FA website. This is basic nutritional advice for footballers written as promotion for March 2011 National Nutrition month promotion. With all the sports drinks on the market, it can get a bit confusing, so click here to read a simplified version of how to understand how they work. "The man who can drive himself further once the effort gets painful will win."